Hello, bloggy friends. Another weekend is drawing to a close and I have, of course, been crocheting. This project has a deadline, which means I am having to push myself to work on it every day, though tonight I’ve had to put it down because the wrist is hurting too much (probably from the gym work, rather than the yarn manipulation). Michaels had a “30% off all yarn” day on Thursday so my friend and I went over there and bought yarn and other fun stuff. I picked up two skeins of the Red Heart Super Saver Ombre in Scuba – turquoise is my favourite colour but it’s also a good colour for a baby blanket. These are big balls! Ten ounces/482 yards big! I have crocheted up almost a whole skein and so far I have a rectangular granny that measures about 23 x 16 inches, so it looks like I’ll be making inroads into the second skein for sure. So as I said, the wrist is pretty painful tonight. Tai Chi Man and I went to the gym and I wore my wrist brace for the first time since last Sunday’s gym session. Even though I’m not using my right hand while at the gym (because lifting even a cup of tea is beyond me right now) I am trying to use my forearm on the weights machines, but it still strains the wrist a bit. The night before last, I had a really painful night and got up early. Last night was better. I have been doing the exercises that the hand therapist showed me, but also doing stuff around the house like cleaning out the fridge freezer, doing the seasonal review of my closet, and sweeping and mopping the deck where the pine needles off the neighbour’s tree have gathered and stained it. It’s a fine line between pushing yourself far enough that you improve your strength and flexibility long term, and hurting yourself and setting things back. Turns out that the morning tingling/numbness in the fingertips was caused by me curling my wrist inwards while I slept and putting pressure on the carpal tunnel. Now that I know to keep my hand straight, that situation has improved. Before I sign off, I thought I’d show you my latest hair art! I added turquoise and hot pink Manic Panic to my hair with gloved fingers, and this is the result. I call it unicorn hair! It took six days but I managed three inches of knitting stockinette in the round for the hat for my father-in-law, and tonight did the folding/provisional cast on removal/three needle trick to get the folded brim all done. I have now graduated to the larger needle tip (US#5) for the body of the hat. I’m pleased that when I folded it I didn’t lose all the blue to the back. The dark green is nice, but I’ll enjoy the brighter colours even more. I love the feel of this Lion Brand Mandala yarn – it’s very wool-like. Yesterday I had my last X-ray and doctor checkup for the time being (six weeks post-surgery) and today I met with a hand therapist at the hospital and was given exercises to do. She measured the angle that I could move my hand to in different directions so that we can check for progress next time. 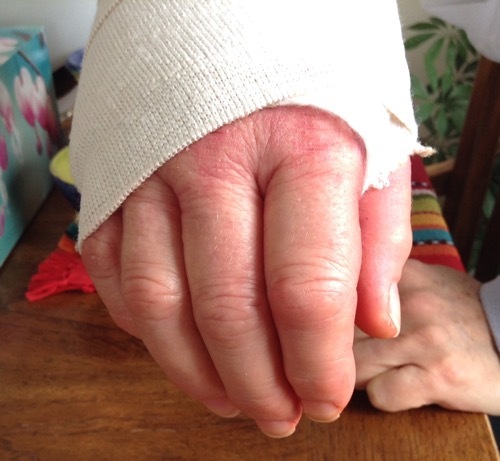 I’m also supposed to apply a bit of pressure to the scar tissue with my thumb and move the skin around to prevent adhesions underneath the incision area – not keen on that! My boss is going to be scheduling me for shifts the week after next. I will have to take things slowly. I will be able to do cash, as that is mostly operating a touch screen, but I’m hesitant to try cutting and lifting fabric too soon. A nice co-worker has lent me a pair of left-handed scissors which I’m going to practice with, as that would solve the cutting problem at least. As for lifting, I can barely hold a small mug of tea or a book so bolts of fabric are out of the question. I was feeling so accomplished after the Paper Bag Princess project was done, despite the delays and discomfort from my wrist injury. At the beginning of this year, I had a goal in mind (uncharacteristically) to make 12 sweaters in 12 months. I whizzed through the first two, and was almost done with the third, all in the space of a month and a half, when the snowboarding crash happened. It’s been two months since then, and for a while I couldn’t do any crochet or knitting. Then I managed some gentle crochet, left handed, and made a bulky cowl and finished off the doll project. Encouraged by that, I decided it was time to try knitting. Of course, my sweater goal has been pretty much abandoned, at least for the time being. But I wanted to make something for my father-in-law, who, like my mother, is often very generous. He is getting on in years and I have heard he is feeling the cold more these days. Even though he hasn’t been a hat-wearer in the many years I’ve known him, I feel that he will appreciate one made out of a colourful yarn. If nothing else, he loves his colour. So out from the stash came the Lion Brand Mandala in the colourway Chimera, which is what I would describe as a muted rainbow. Blue through dark and light green, mustard yellow, orange, magenta and brown. I have only made one other project with the Mandala – my Spill shawl – but I love this DK weight yarn and the colours it comes in. The pattern I chose is the Vanilla Hat. It’s a really basic stockinette hat with a folded hem and a simple crown with four decrease lines leading to the centre. I’m not sure how many of the colours of the cake will fit into the hat, but I’m hoping for the brightest ones at least. Progress is slow. When I first cast on, my gauge was a little loose so I ended up ripping out the first few rounds and restarting with a smaller needle size – US#4 (3.5mm). During my first session of working on this hat, I was feeling quite comfortable, thinking how my wrist seemed happy to be knitting. Unfortunately the next day I changed my mind. I think the fine motor movements of the Continental knitting, which does have a reasonable economy of motion, aggravated some out-of-practice muscles and tendons. So I am having to be careful to do a small amount at a time. My hospital appointment for the six week post-surgery checkup is this Tuesday. I hope to hear that my recovery so far is typical for the type of injury. 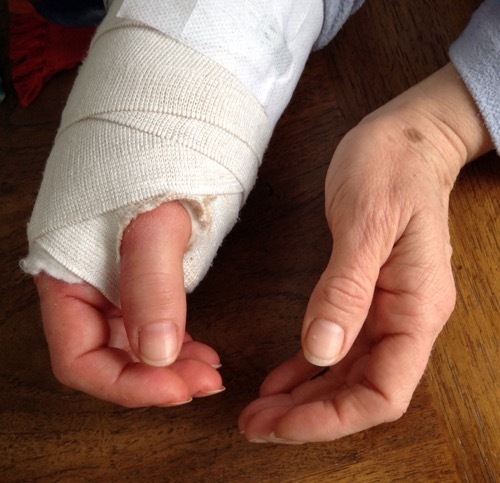 If I am to get back to normal, or as close as possible, I know that I have to exercise the hand and wrist and that some pain is to be expected. I hope that you had a wonderful weekend and that your crafting is going well. What are you making? 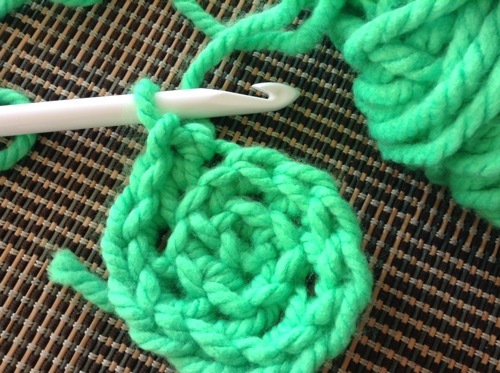 Once my bandages were off, I was itching to try a little crochet. 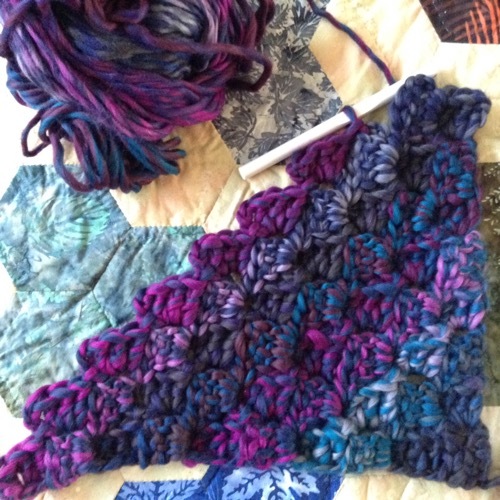 I had another play with the bulky green yarn and a giant hook and felt confident enough to pull out this Loops & Threads Facets yarn (Amethyst colourway) and a 10mm hook and start a cowl. I chose the C2C because it only involves a small amount of chaining. Working left-handed means I have to reverse everything which can mess with your head a bit, but it seems to be working out. I can only make a small amount of progress each day because I don’t want it to hurt. The above photo is the first day’s progress. Below is the third day. After this cowl is done, I’m hoping to go back to the doll. I had a lovely package in the mail yesterday. One of the other moderators in the Crafternoon Treats Ravelry Group knew about my injury and asked for my address so she could send me something. She lives in Norway and by the time it arrived I had forgotten all about it. 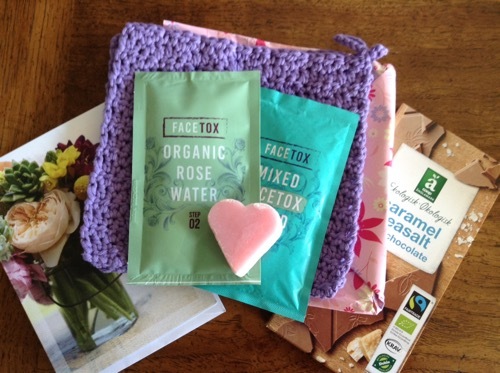 She sent two crocheted washcloths, a clay and rose water face mask kit, a rose-scented heart soap and some chocolate. How sweet is that? It made my day! Spring seems to have arrived in our valley. 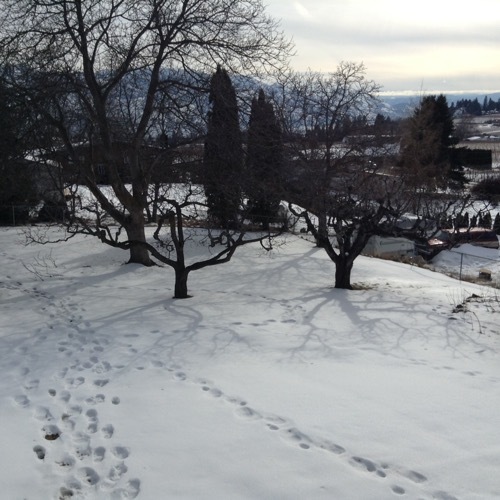 The snow is mostly gone and Tai Chi Man says he spotted some daffodil shoots in the garden today. It’s mild and sunny this weekend. Ooh, I nearly forgot! I hit a milestone today (autocorrect changed that to “smile stone”) as I was actually able to put on a pair of jeans for the first time in over a month. But this typing is making my arm hurt like crazy so I am signing off for now. Happy Spring! I was very relieved to have my appointment at the hospital today. They removed the splint and bandages which, thanks to periodic swelling, have been so darned uncomfortable the last two weeks. I was disconcerted to find metal staples underneath and not dissolving stitches. 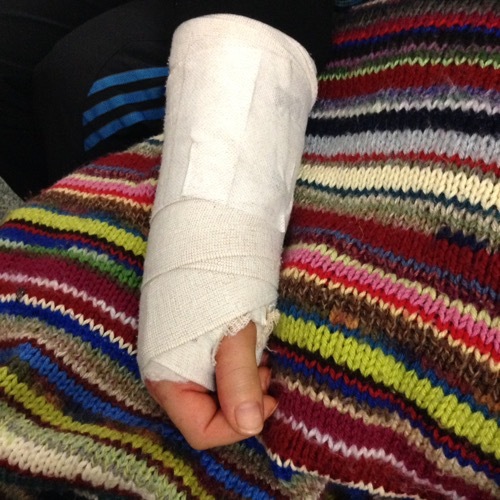 My arm looked so pathetic – loose crumpled skin, loss of muscle, green and yellow bruising on the staple side. The X-rays look kinda cool with that chunk of metal in there, and the line of staples too. The staples were taken out, which was so painful I nearly cried (I couldn’t watch). Tai Chi Man was there and would have offered a shoulder if I’d needed it, but I held it together. Now I have a removable wrist brace, which I can adjust if I get some swelling, and have to take off now and then for strengthening exercises. Official physiotherapy starts in two weeks. What a treat it was to get home and wash my arm, and put some arnica cream on the green and yellow bits. 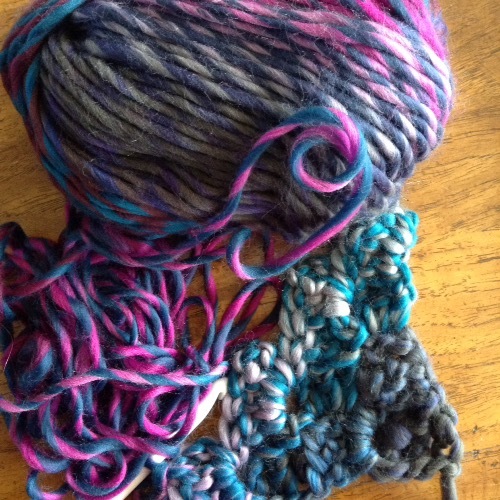 And maybe soon….a little yarn play?! One week to go. Thankfully I have only needed one pain pill on each of the last couple of days. It’s more uncomfortable than anything, especially when my arm swells up. The weather went from snow on Monday to beautiful sunshine on Tuesday, and today we are having diffuse sun. I have enjoyed a neighbourhood walk the last two days which adds a bit of variety, exercise and fresh air. All my menfolk have been out working every day this week so I’ve had a few days of alone time. This is fine as long as I can feed myself one-handed! Whilst I can do a little tidying and laundry, I can’t do vacuuming or complicated meal prep. Lunch today was a turmeric miso noodle soup, the recipe for which turned up in my email inbox from The Garden Grazer. I sat outside for a bit while the house aired. 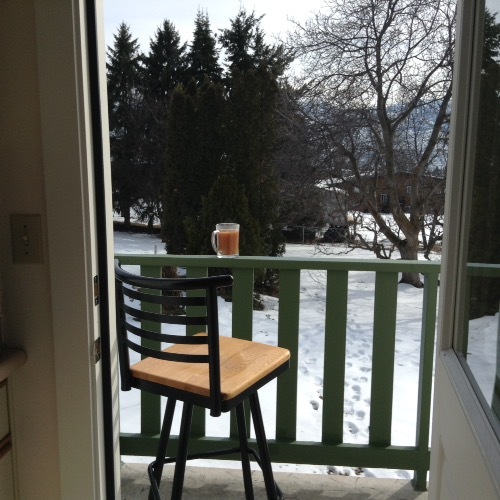 Took my giant cup of tea and kitchen stool out on the deck. 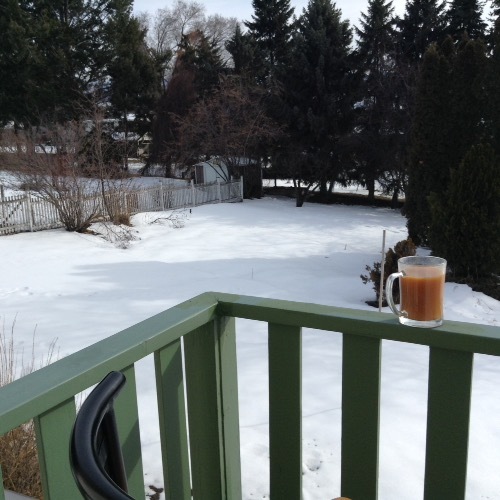 The calendar and temperature may say Spring but there’s still a lot of snow around. The clocks go forward this weekend. 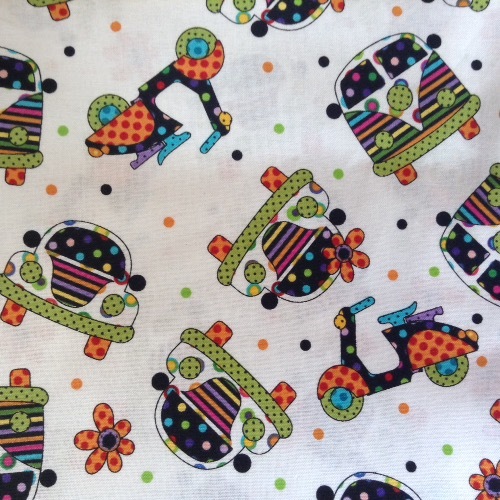 Aren’t these just the most awesome fabrics?! 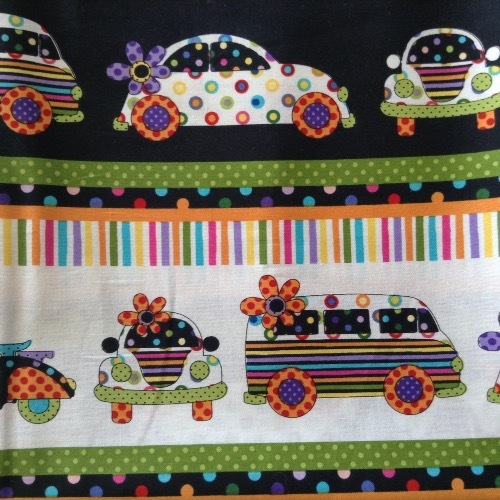 I had a friend drive me to the fabric store where I work today so I could say Hello to my co-workers and get a sewing pattern and this quilting cotton was on sale. I had had my eye on it for a while. I snapped up a metre of each in case they sell out before I get back to work. I attempted a bit more knitting and crochet yesterday but it was a pain, literally – I had to give up after a few minutes. I have adapted to the one-handed life now, and the family is learning what I can and cannot do. They are having to help with cans, jars, chopping, hand washing dishes, vacuuming, etc. I’m getting more comfortable with writing with my left hand. Over the last week I’ve read two ebooks and most of a regular one, and watched a season of Imposters on Netflix. Today the big task that I’ve been procrastinating over for years was finally started. I pulled out the flash drive of backed up digital photos from the fire safe and started to upload them, rename them and sort them into folders for eventual creation of Photobooks. If I can get this job done while I’m off work, I will consider my time well spent. Hopefully you are all well and happily crafting away. Talk to you again soon. So, what have I learned this week? First lesson: obviously, not to crash on the ski hill. Taking a tumble over another snowboarder is a bad idea, in my case resulting in a fractured distal radius and a massive bruise on the opposite forearm. Second lesson: broken bones hurt. Particularly at the time of the break, but also afterwards, including when in a cast. Not so much that I’ve needed painkillers since Monday, but enough to be uncomfortable. Third lesson: don’t over-extend yourself. 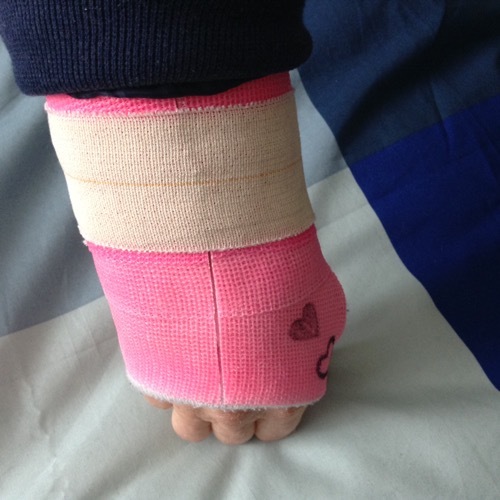 I was reaching for something last night, overbalanced and put pressure on the cast and it hurt like hell. Also too much activity means too much blood to the hand and the cast gets uncomfortably snug. On the bright side, I can read, watch Netflix, go for walks, write (very messily with my left hand, but I’m practising to get better), wash and apply deodorant, get dressed as long as doesn’t involve a bra, make tea and simple meals, do laundry, load and unload the dishwasher, and type. I could even, maybe in a couple of weeks, go back to the gym and go on the treadmill, or attempt a yoga class (just not downward facing dog)! The lovely yoga teacher is already planning modified poses for me. I’m doing my best to balance my days, not spending too much time on any one activity. And I have friends who will give me rides to appointments or come over if cabin fever hits. I am grateful for so many things. I only broke one bone, I have a lovely husband who helped me bathe and washed my hair for me (after taping my cast inside a giant plastic bag), I have three able sons, one of whom is home most of the time, who can do the things I am struggling with. I have plenty to do to keep me occupied. Tomorrow we have a potluck planned with friends, which will be awesome.